Animals as Leaders guitarist Tosin Abasi resides in Washington, D.C., and he's a first generation American, as both of his parents are from Nigeria and emigrated to America before their talented son was born. "They both immigrated here in the late '70s for the same reason everyone else does: the opportunity and chance to actually make a life for yourself based on how hard you want to work," Abasi told Noisecreep about his family tree and its roots. So how did a kid with traditional parents from another continent eventually go on to pick up eight-string guitars? "I was 12 years old and had a friend who had a guitar, and I had been playing clarinet in elementary school band and I had a basic musical ability, but I didn't know if I was good or bad," Abasi said. "A guitar seemed way cooler! It was obviously cooler than a clarinet. I saw an ad in the paper advertising cheap guitars, for like $120, and I told my dad I wanted one and he was open-minded, for a Nigerian immigrant." Papa Abasi bought the guitar for his son, who didn't even know how to tune the instrument. Luckily, the younger Abasi learned some basics from his music teacher, like power chords and his favorite songs. "I learned pretty quickly and was better than my friends who had been playing for years," Abasi said with a laugh. "I was actually serious about it. I kept growing with it and saw how you could eliminate a barrier through focus and trying." While his father was supportive, ponying up the cash for the guitar, he admits that mom was a little more stringent. "My mom definitely represents more of the traditional immigrant mentality of education and conventional channels being way more important than a creative endeavor," he admitted. "She doesn't get it, which is fine, since my dad was totally liberal about the whole thing and encouraging and proud. The two forces balance each other out." 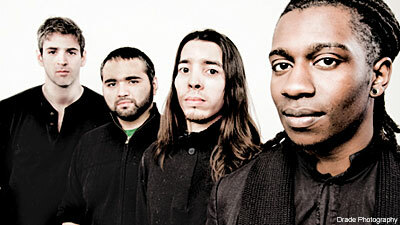 Abasi was in a band called Reflux prior to Animals as Leaders. He left Reflux, went to school for music and when he was done with school, he thought "it made sense to do an instrumental album." He calls AAL "my brainchild." The band's self-titled debut came out last year on Prosthetic.